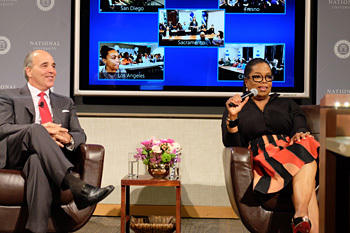 Chancellor Michael R. Cunningham and Ms. Oprah Winfrey conducting a Q&A with National University students following Ms. Winfrey’s lecture: Live Your Best Life on April 7, 2016 in the Sanford Education Center, La Jolla, CA. Photo courtesy of Ken Jacques. Building and strengthening our National University community has been a top priority for me, and part of how we do that is through sharing information on a regular basis and recognizing the many advances and developments that make us such a great University. As we work together to deliver an exceptional student experience, it is imperative that we implement a communication model to engage all stakeholders. As such, I am thrilled to kick off the first edition of our National University Newsletter. This monthly communication will keep you up-to-date on the wonderful developments in our National University community. The past three years have been an exciting time for me serving as both President of National University and Chancellor of the National University System. I’m pleased to have had the honor of working closely with so many of you. When I started at National University as President, we talked about the University being the best-kept secret. I believe firmly we have reached a turning point in that narrative. We are no longer such a secret. I am particularly proud of the work put into developing our 2020 Strategic Framework, which is not just for National University but also for our entire National University System of universities and institutions. We are now entering a phase that requires my full attention on the system-wide level and to bring on a new president for National University. We looked far and wide for the right person and we are thrilled to have Dr. David W. Andrews join us as National University’s fifth president since our founding in 1971. Dr. Andrews has an innovative, entrepreneurial mindset that matches NU’s culture and he is passionate about transforming higher education through collaboration to provide an exceptional student experience. As we look to the future, and National University emerges as a model for the future of higher education, Dr. Andrews brings the vision, experience and academic credentials to move us forward. As we talk more about the National University System, I’d like to take a moment to explain it in more detail. The National University System is a network of accredited nonprofit educational institutions serving higher education and K-12 students. The System is comprised of several education institutions, including National University; John F. Kennedy University, which is located in the Bay Area and has a law school; City University of Seattle, which offers a Doctorate in Business Administration and an Ed.D. ; WestMed College, a healthcare vocational school; and the Division of Pre-College Programs. As Chancellor, I will be focusing my attention on creating more fluid pathways for students to pursue professional and terminal degrees across our institutions. This month has been an historic one for our University. We not only welcomed a new president, but we also had a visit from a very special guest. We are so excited that Oprah Winfrey was able to share her message with our National University community! Her lecture, Live Your Best Life, was webcast live from the Sanford Education Center in La Jolla, reaching thousands of students, faculty, staff and alumni. Ms. Winfrey’s words were an inspiration to us all and represented an historic moment for the University community to share in such a unique and meaningful experience. So that we can continue to be inspired by Oprah’s message, a link to this filmed presentation has been made available exclusively for our National University community. So much of what Ms. Winfrey speaks to in leading an intentionally good life resonates with our faculty, staff, students and alumni, who are dedicated to education and passionate about giving back to others. This remarkable presentation will only be available until April 30, 2016, so watch now and let Oprah inspire you to Live Your Best Life.